All books have lags between writing and publication, but rarely has that delay weighed as heavily on a book as it does in the case of Sen. Bernie Sanders' Our Revolution: A Future to Believe In. The senator's political autobiography and wonkapalooza — a follow-up to his earlier tome Outsider in the White House — covers events up until late September of this year. That timetable permitted publication in mid-November, probably reflecting Sanders' desire that his radical agenda be included in national conversations while a moderate Democrat — Hillary Clinton — prepared to assume the presidency. That's not how things turned out, of course. And Donald Trump's shocking victory profoundly affects perceptions of the recently released tome by the former presidential candidate. More than half of the book is devoted to detailed examinations of issues the socialist senator has long emphasized, among them economic injustice, "horrendous trade policies," affordable health care and higher education, climate change, social protections, and corporate control of mass media. Sanders' prescriptions for change would have read like a set of (somewhat) realistic aspirations with Clinton in the White House. On the threshold of the New Dark Age, however, they come across as high-minded fantasy. 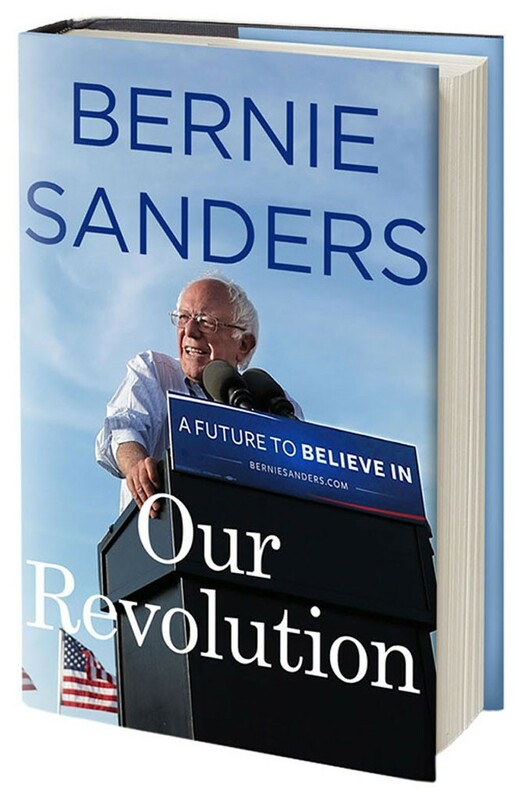 Our Revolution: A Future to Believe In by Sen. Bernie Sanders, Thomas Dunne Books, 464 pages. $27. Readers will be left yearning for a Sanders analysis of why Trump won (an issue he addressed in a subsequent speech), along with, perhaps, a rant on the illegitimacy of an outcome in which the "loser" gets 48 percent of votes cast and the "winner" gets 46.7 percent. The book offers militant Bernie bros no guidance on how to play their Sisyphean roles during the next four years, either. The cramped publication schedule of Our Revolution lends it a rushed quality. There's no index — and, still more unfortunately, Sanders' prose reads like a speech transcript. Because no ghostwriter was involved, the book does have an authenticity of voice; it's a prime display of the senator's characteristically compelling, and hectoring, tone. Members of Sanders' audience familiar with his Vermont political career and presidential campaign won't find any revelations in Our Revolution. The book does, however, include a few interesting spins within its standard narrative. Sanders emphasizes his Jewish identity in a passage in the book's brief section on his Brooklyn childhood, titled "How Do We Turn Out the Way We Do?" Most of his father's family perished in the Holocaust, he notes, and "I remember crying whenever I saw photos in a book on the destruction of the Jews." Recounting the circumstances leading to that calamity in Germany, Sanders makes an unintentionally eerie reference to "the rise to power of a right-wing lunatic in a free election." This narrative also provides a tellingly psychoanalytic take on how financial struggles at home affected Sanders and his older brother, Larry. "There were arguments and more arguments between our parents. Painful arguments. Bitter arguments. Arguments that seared through a little boy's brain, never to be forgotten." Sanders' political education was furthered by the 1957 departure to Los Angeles of his beloved Brooklyn Dodgers. Owner Walter O'Malley's "devastating decision to rip the Dodgers out of Brooklyn in order to pursue greater profits on the West Coast was, I suspect, one of my first observations regarding the deficiencies of capitalism." We're informed, too, of the life-changing significance of a summer Sanders spent at a camp in upstate New York as a 13-year-old. "It turned out that I really liked country living," he writes. "I doubt very much that I would have ended up in Vermont, one of the most rural states in the country, if I hadn't gone to Scout camp." Sanders' romantic life in young adulthood merits a few sentences. After marrying University of Chicago classmate Deborah Shiling in 1964, he recounts, he spent $2,500 of the "bit of money" he inherited from his father to buy 85 acres of woodland in Middlesex, Vt. By 1968, he was divorced from Shiling and living with Susan Mott, whom he had met while working at a Head Start program in New York. "On March 21, 1969, our son, Levi Noah Sanders, was born in Saint Johnsbury, Vermont." Then the autobiographical part of the book briskly moves on to the author's political career — and stays there. Again, a lot of what Sanders relates regarding his mayoral years in Burlington will present no surprises to Vermont readers, perhaps even those born after he took office in 1981. This account, however, omits mention of the Alden Plan for waterfront development that pitted Sanders in a losing fight against Burlington's green left. The book's section about his decision to run for president likewise contains no news, and much of it reads like a monotonous travelogue. It's a potted tale, except for the confession that his wife, Jane, "was not enthusiastic about the idea of a presidential campaign. Never was." Jane gets a happy ending of sorts, however, in a subsection of the book that might have been titled "Breakfast at Denny's." One Sunday morning at Denny's in South Burlington, Sanders recalls, a customer thanked the senator for helping him procure veterans' benefits and urged him to run for president. Like Truman Capote's Holly Golightly gazing into Tiffany's display window, Jane suddenly had her eyes on the prize. "Jane started crying," her husband writes. "She now knew what we had to do." As a prelude to the few short chapters on the campaign itself, Sanders highlights its indisputably historic and inspirational achievements. In addition to raising $232 million from 2.5 million donors, he earned 13 million votes in the Democratic primaries and caucuses, carrying 22 states and winning 46 percent of pledged delegates to the nominating convention. He accomplished all this, he rightly points out, by contrasting his revolutionary messages with the more-of-the-same positioning of his party and the Clintons' powerful political machine. Sanders' book, like his campaign, is a purely domestic affair. Amid all his speeches and page after page, chart after chart devoted to issues, there is almost nothing about foreign policy. Sanders does criticize Clinton's poor judgment on momentous matters such as voting for the War in Iraq. But he's silent on what a President Sanders would have done about ISIS, China, Africa and Israel/Palestine. One final criticism: Our Revolution is an ill-advised title for both the book and the movement Sanders leads. The possessive case might be read as excluding anyone who was not already on board. And such an approach is especially wrongheaded in the time of Trump, when it's essential to unite all who can be united. I learned a lot living in Stannard. I learned about the beauty of walking on quiet dirt roads, seeing deer in the fields, and finding paths that led to the remains of old farmhouses that had not been occupied for decades. I learned about the friendships established when you live in an isolated community—five miles from the nearest store or gas station. People need people, and that developed a different type of community than I had previously known. In a Wall Street Journal poll released on November 3, I was defeating Trump by 9 points and Marco Rubio by 5. Throughout the campaign, from late November to the end of my campaign, I defeated Trump in twenty-eight out of thirty national polls, almost always by double digits. In almost all of those polls during that period, I was running much stronger against Trump than Clinton. The original print version of this article was headlined "Manual for a Movement?"